PHP arrays and loops are like peanut butter and jelly; they just go together. When you start to use arrays in HTML5 and CSS3 programming, eventually, you’ll want to go through each element in the array and do something with it. The for loop is the perfect way to do this. 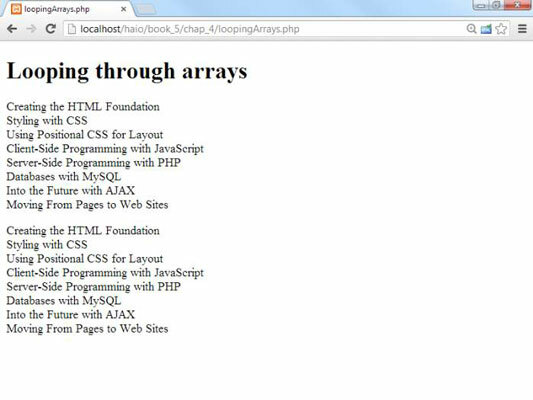 Look at the loopingArrays.php code to see an array with a couple of variations of the for loop. The array is preloaded. There’s no problem with the fact that the array statement (although a single line of logic) actually takes up several lines in the editor. Build a for loop to step through the array. The loop needs to happen once for each element in the array; in this case, that’s eight times. Set up a loop that repeats eight times. It will start at 0 and end at 7. Use the sizeof() function to determine the ending point. Because you know that this array has eight elements, you could just set the condition to $i < 8. The sizeof() function is preferred because it will work even if the array size changes. Also, it’s easier to understand what you meant. sizeof($books) means “the size of the $books array.” The number 8 could mean anything. Inside the loop, you simply print out the current element of the array, which will be $books[$i]. Don’t forget to add a <br /> tag if you want a line break in the HTML output. Add the n to keep the HTML source code looking nice. The foreach loop is a special version of the for loop that simplifies working with arrays. Here’s how it works. Use the foreach keyword to begin the loop. This tells PHP that you’re working with the foreach variation. The first parameter is the array name. The foreach loop is designed to work with an array, so the first parameter is the array you want to step through. Create a variable to hold each element of the array. On each pass through the loop, the $book variable will hold the current element of the $books array. Most of the time, you use a loop for an array because you want to deal with each element of the array. Using a foreach loop makes this easier. Use the $book variable inside the loop. The $book variable is ready to go. The nice thing about using foreach is you don’t have to worry about indices. The $book variable always contains the current element of the array. Many languages have variations of the loop, but they differ greatly in the details. Feel free to use the loop, but be aware that it doesn’t translate between languages quite as freely as most operations. Arrays are great because they’re used to hold lists of data in your programming language. Of course, HTML already has other ways of working with lists. The and tags are both used for visual representations of lists, and the object is used to let the user choose from a list. 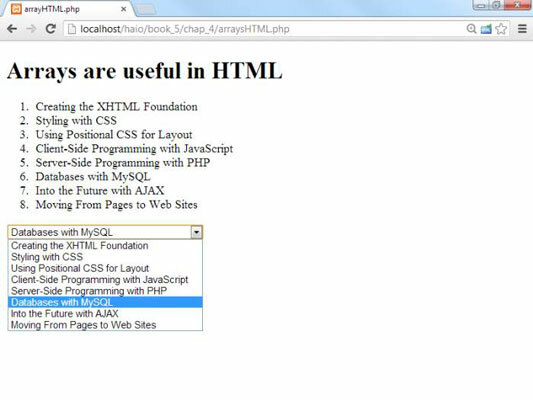 It’s very common to build these HTML structures from arrays.